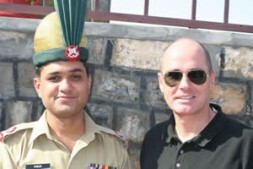 German entrepreneur and geostrategist Dr. Hubertus Hoffmann, President of the World Security Network Foundation: "In Pakistan, three decisive international political conflicts are currently being decided: the fight against Al Qaeda and representatives of an aggressive, militant Islam; the stabilization of Afghanistan; and the continuing unhindered and peaceful ascent of India. Those who would now give up on Pakistan have already lost these three contests." Pakistan – a large and beautiful Islamic country in Asia with 166 million inhabitants – is squeezed in between the economically booming India with 1.1 billion inhabitants and Afghanistan, wasted away after years of war. In the West, Pakistan receives bad press; the media’s list of negatives is indeed long: in many of the Madrassas, the many thousands of small religious schools, a militant version of Islam and Jihad is preached and terrorist ideology is taught; Al Qaeda, a thousand-headed deadly tarantula, is active across the country; Pakistan does too little to combat terrorism; the father of the Pakistani atomic bomb, Dr. Abdul Qadeer Khan, traded sensitive nuclear technology to North Korea for cruise missile technology, while the Pakistani Secret Service ISI looked the other way; the country with its approximately 50 nuclear weapons threatens its neighbor India and continues indirectly to support terrorists in Indian Kashmir. The West has practically given up on Pakistan; this region of the world seems to have too little transparency, is too insecure, and is too militantly Islamic. However, the U.S. and NATO need Pakistan and its President Pervez Musharraf, the controversial and strongest man in the state, as an ally in the fight against Al Qaeda and to assist in the stabilization of Afghanistan more urgently than ever. In Pakistan, three decisive international political conflicts are currently being decided: the fight against Al Qaeda and representatives of an aggressive, militant Islam; the stabilization of Afghanistan; and the continuing unhindered and peaceful ascent of India. Those who would now give up on Pakistan have already lost these three contests. It lies in the fundamental self-interest of the U.S., Europe, Russia, India, China, and other Asian countries to see that Pakistan is neither isolated nor ignored out of disappointment and left to itself. Rather, an active and engaged partnership with Islamabad should be pursued, and in particular to now assist the country on its way out of the line of fire. We need a new comprehensive Grand Strategy for Pakistan, not mere words of advice. What are the myths, the facts and the chances for Pakistan? Is President Musharraf a Brutal Military Dictator? "President Musharraf now has a track record which is more positive than negative with respect to freedom and democratic progress compared to many other governments in Pakistani history." A tailored democracy. In the person of President Pervez Musharraf, the tensions and conflicts of Pakistan manifest themselves as in a magnifying glass. The title of his memoirs “In the Line of Fire” published this year is indeed appropriate. As the commander of an elite Special Forces Brigade, he fought two wars against archenemy India in 1965 and 1971. He rose to the rank of General and the Army’s Chief of Staff in 1998. In 1999, the then Prime Minister Nawaz Sharif dismissed Musharraf during a bitter confrontation, blocked his airplane from returning to Pakistan, and appointed General Ziauddin as the new Army Chief of Staff, in defiance of the Secretary of Defense and top Generals. The army remained loyal to their former commander and rebelled against Sharif. Lieutenant General Mahmood Ahmed, commander of the Rawalpindi Corps, took the Prime Minister into custody. The Army took command over all major cities, most of them friends-in-arms and appointees of Musharraf, and with the important support of the Director General of Military Operations (DGMO) Sharid Aziz, on whose orders the Army moved. Musharraf refrained from establishing martial law, allowed the constitution to remain in force with the exception of a few clauses, dissolved the Sharif government, and became President and politician. Unlike his predecessors, he allowed political freedom; political parties were not banned and the media is free as well. 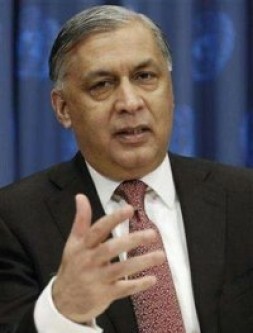 In his memoirs he wrote, “We all in the Army wanted to ensure that this would be the last time the Army was forced to assume leadership of the country.” The phenomenal banker Shaukat Aziz was named the new Finance Minister, and later became a particularly important Prime Minister and reformer. “I believe that no other country can progress without democracy, but democracy has to be tailored in accordance with each nation’s particular environment. Only then can it be a functioning democracy that truly empowers people. If it does not function, then it merely creates a façade without spirit and substance,” stated the President in describing his fundamental position. In October of 2002, he held free elections to the National Assembly and four provincial assemblies; next year there will be another national election with many different parties, as well as those like the PPP or the Islamic party MMA, who oppose the president. His seven-point vision for Pakistan includes: rebuilding national confidence and morale; strengthening the federation, devolution of power to the grassroots level, restoring investors’ confidence, ensuring law and order; and depoliticizing state institutions and ensuring accountability. President Musharraf now has a track record which is more positive than negative with respect to freedom and democratic progress compared to many other governments in Pakistani history. "The approx. 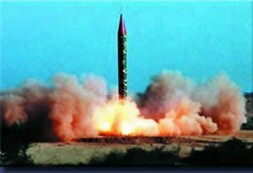 50 nuclear weapons belonging to Pakistan are the military’s most coveted possessions—well protected in secret depots. The generals of Pakistan are highly professional, educated in the British tradition, are rational and are not adventurers who would permit access on the part of radical Islamists to nuclear weapons systems. According to historical experience, the high-ranking officers of the Army would never support a radical nationalist-Islamist President or Prime Minister, as this orientation does not correspond to their future concept for Pakistan." Is There a Threat of a Military Coup? 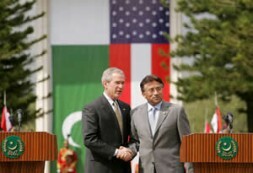 No: The history of the failed attempt at removing the former Army Commander Musharraf from power by an opposing Prime Minister, followed by the successful and nonviolent countercoup clearly shows that the Army holds the power in the state, and without the support of the majority of their top generals acting together a coup could not be successful regardless of the political group. In this respect, the Army does not follow a fiery revolutionary colonel such as Egypt’s Colonel Nasser in 1952 or Colonel Kadafi in 1959 in Libya, but rather only the commanding three-star generals belonging to the Corps Commanders’ Conference and the influential two-star General DGMO. The Pakistani army is the only stabilizing factor in the country, the commander is a man of checks and balances to the political system as there are no other balancing authorities as of yet such as a strong parliament or Constitutional Court. In this regard, neither a putsch by radical officers nor a takeover by politically radical Islamists is to be expected in Pakistan. Will There Be a Takeover by Radical Islamists of Political Power and the Atomic Bomb? No: The approx. 50 nuclear weapons belonging to Pakistan are the military’s most coveted possessions—well protected in secret depots and from the military’s perspective irreplaceable with regard to presenting a credible deterrent against India. The Generals of Pakistan are highly professional, educated in the British tradition, are rational and are not adventurers who would permit access on the part of radical Islamists to nuclear weapons systems. According to historical experience, the high-ranking officers of the Army would never support a radical nationalist-Islamist President or Prime Minister, as this orientation does not correspond to their future concept for Pakistan. Viewed historically, the tense situation in Germany in 1933 was totally different because the Wehrmacht Forces acted in an intensely unpolitical manner, they obeyed the newly named Chancellor Adolf Hitler unconditionally as the Supreme Commander, and did not interfere in politics. Is Pakistan a dangerous heaven for Radical Islamists? No: Pakistan is a nation deeply influenced by Islam—just as Italy is influenced by Catholicism. More than 90% of its citizens live a life of peaceful and positive Islam, are friendly and tolerant. Only a small minority are fundamentalist Islamists. In the election of the National Assembly in October 2002, the Islamists represented by the MMA only received 11% of the votes and 20% of the seats. For them to reach a majority in the coming election next year is unachievable. The less tension there is from Afghanistan and Kashmir, and as more and more people take part in the educational system and enjoy a modest level of prosperity, the less acceptance the radicals will have. In addition, a more positive image of the West and a credible openness and the dialog on the part of the U.S. with the Muslim world could dry out the quagmire of the radical Madrassas. Does Pakistan Do Enough Against Terrorism? Yes: President Musharraf risks his own life each day because of his fight against Al Qaeda and Kashmiri terrorists who have tried to kill him twice. Well before 9/11, Pakistan started taking action against international terrorists, for example, through the Antiterrorist Pact of 14 August 2001; it has also taken several political, legislative and administrative decisions against terrorism. "More than 90% of its citizens live a life of peaceful and positive Islam, are friendly and tolerant. Only a small minority are fundamentalist Islamists." Does Pakistan and Its Secret Service ISI Destabilize Afghanistan? No: In the 1980s, the Pakistani Secret Service ISI supported the Taliban in order to maintain their influence in Afghanistan and their strategic gateway to Central Asia. According to the generals, Afghanistan is still considered a vital terrain, providing a balance to the powerful threat posed by India. The protective function of few former ISI officers for some Taliban leaders sought by NATO and the U.S. derives from this time and corresponds with ancient clan laws. However, this outdated, pro-Taliban ISI strategy stands in contradiction to the new challenges Pakistan faces. With a friendly government in Kabul, and in cooperation with the U.S. and the West, Pakistan can reach its strategic goals much easier and faster. Until now, the West was lacking the necessary comprehensive strategy for a new peace—and economic structuring of Central-Asian countries including Afghanistan and Pakistan. Politicians and generals justifiably demand a new Double-Strategy from NATO in Afghanistan, comprised of intelligent politics and military power in order to stabilize the situation, as well as the inclusion of the Pashtuns in the government in Kabul. Policy of Détente or Conflict Concerning India? "The Ice Age is over - The credible nuclear balance between the two archenemies provides a solid basis for the beginning of the new policy of détente involving many small steps, supported by President Musharraf, which began only about a year ago. History’s lesson is that only a maximum amount of autonomy, respect for the Muslim population, and first steps of a unilateral demilitarization of the Indian part of Kashmir can lead to true peace." 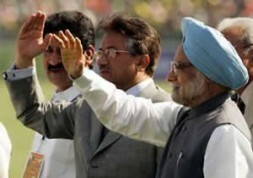 After the disastrous earthquakes in the Pakistani section of Kashmir on 8 October 2005 (7.6 on the Richter scale and 73,000 dead), the Indian Prime Minister Dr. Singh approached President Musharraf and offered India’s assistance. The détente began: a telephone hotline was activated for both governments. The Indian Air Force brought relief supplies to Islamabad. Four telephone facilities were set up to enable divided families in Kashmir to contact each other, as well as the first new border points across the Line of Control and the first bus line. However, Jihad groups continued their attacks against Indian facilities in Kashmir and tried to torpedo the new policy of détente by disastrous bombings in New Delhi and Mumbai. On 29 October 2005, terrorist bombs killed 62 people in New Delhi and on 11 July 2006 seven bombs killed 190 people in Mumbai. The bombs of radical terrorists are intended to kill the dove of peace over Kashmir. History’s lesson is that only a maximum amount of autonomy, respect for the Muslim population, and first steps of a unilateral demilitarization of Kashmir beginning with India can lead to peace—as proposed by Musharraf. The Indian side still hesitates, demanding an unrealistic end of infiltration and violence as the initial precondition. The first roundtable approach with groups from Kashmir initiated by India’s Prime Minister Singh was a significant step forward toward dialogue and peace. Including best practice solutions from other parts of the world now, the thaw will continue and lead step by step to a stabilization of Kashmir. Above all, two parallel interests support a thaw of the more than 50-year-old blocks of ice: both Pakistan and India want to bring their countries forward through significant economic growth; a war would set them back years; terrorism, with its historic roots in Kashmir, is a threat to both governments. Pakistan is pursuing a vision of peace and cooperation by conducting a composite dialogue with India in order to achieve a just peace based on mutual interest. How Stable is the Pakistani Economy? An economic miracle: the Governor of Punjab, Lt. Gen. (Ret.) Khalid Maqbool gets to the point of internal Pakistani politics from his residence in Lahore: “We are not a perfect political system. But we had free local elections, next year we will have free national elections with all major parties involved, and we enjoy a free press. The people of Pakistan want to see leaders who deliver and make their life better.” Investors from China want to construct an enormous industrial park in Lahore with Chinese companies, he proudly says. New hotels for Chinese tourists and Sikhs from India are being built. He himself worked his way up from a poor background in the Army. "The courageous economic reforms of Prime Minister Shaukat Aziz with a growth of the GDP of more than 8%—second only to China—is a grandiose achievement in a difficult political environment and the basis for stability in Pakistan." Prime Minister Shaukat Aziz said in a keynote address to the Young President’s Organization in Lahore: “Pakistan has been ranked as one of top ten reformers globally and the top reformer in the South Asian region. We are determined to ride the globalization tide and turn this challenge into an opportunity.” After seven difficult years, the current government has implemented an ambitious reform agenda covering all aspects of life—political, administrative, social and economic, driven by deregulation, liberalization and privatization. Political institutions have been reformed with greater representation for women and minorities and the institutionalization of democratic norms. In all sectors, foreigners can hold 100% equity. Investment in the economy has reached 20% of GDP, and FDI has reached its highest mark ever at USD 3.5 billion this year and a growth of real GDP for 2004–2005 of 8.4%, second only to China. Agricultural production is up 7.5%, industrial output 15.4%, and the service sector 7.9%. The number of people living below the poverty line has been reduced from 34.5% to 23.9%. The World Bank, IMF and the Asian Development Bank praised the growth and development of Pakistan’s economy in the last years. The investment climate is becoming more and more business-friendly. The courageous and strategically well-defined economic reforms of the Aziz Government have, for the first time, opened up the country to foreign investors. They have also made it able to compete with India and have accelerated the economic growth—a grandiose achievement in a difficult political environment and the basis for stability in Pakistan. Do the U.S. and Europe Have an Intelligent Strategy Regarding Pakistan? The tribal areas FATA will receive much more direct assistance from all NATO countries in close cooperation with Pakistan. "A new comprehensive Grand Strategy for Pakistan is needed now. It should include extensive exchange programs for the young elite of this important Asian country." Extensive exchange programs for the young elite of Pakistan including scholarships. * German entrepreneur and geostrategist Dr. Hubertus Hoffmann is Founder and President of the www.worldsecuritynetwork.com Foundation and author of two standard books on nuclear weapons. Suggested reading: Pervez Musharraf, In the Line of Fire – A Memoir, Simon & Schuster U.K. 2006; ISBN -13:978-0-7432-9582-6; Anwar Dill (editor), Strategy, Diplomacy, Humanity. Life and Work of Sahbzada Yaqub-Khan, Intercultural Forum Taksila Research University San Diego/Islamabad 2005 ISBN 0-9755860-1-7.